BacPac is fast OpenVMS network backup software for VAX, Alpha AXP, and Integrity (Itanium IA64) platforms, combining state of the art file compression, client/server architecture, and network communications. BacPac is used to backup disks and files between OpenVMS computers which communicate over a Local Area Network, Metropolitan Area Network, or Wide Area Network. The OpenVMS computers can be VAX, Alpha, or Integrity computers and do not have to be clustered. 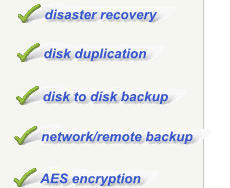 Disaster Recovery BacPac’s unique features allow faster backup and restore times, especially in disaster recovery situations: Duplicate a disk image over a LAN, MAN, or WAN network Make both an image copy and a saveset backup at the same time for added safety The backup from the production system to the disaster recovery system is faster because the data is compressed before transferring over the network. The switchover to the disaster recovery system is much faster because the disks are ready to use immediately and do not have to be restored from savesets on disk or tape. Network/Remote Backup BacPac allows the following types of OpenVMS network backups Make saveset backups to remote OpenVMS disk or tape drives. This supports file mode and image mode. Restore from remote savesets on disk or tape drives. Local Backup BacPac performs incredibly fast disk-to-disk backups on local disks and can also speed up backups to local tape drives. .